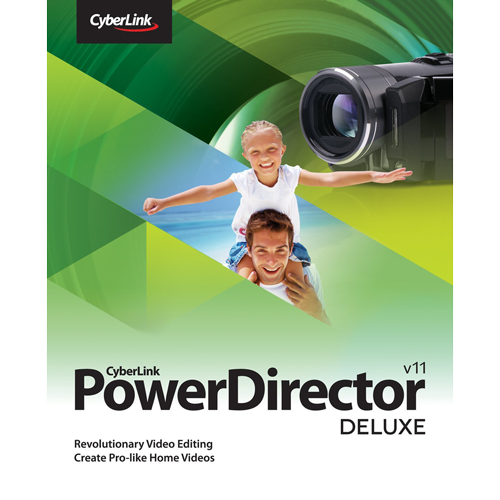 PowerDirector 11 Deluxe provides the easiest and fastest way to create and share your home videos. With 300+ editing tools and 100+ built-in effects, you can easily turn your home videos into your all-time favorite home movies. No time to create videos? Simply select your video footage and photos, and PowerDirector 11’s MagicStyle tool will automatically add pro-looking templates, transitions and music, so you'll have professional-looking videos in minutes! Magic movie tools provides you the easiest and automated way to edit your videos. Simply select the videos and photos you want to use in your creation, Magic Movie tool will automatically add stylish templates, transitions and music, then complete your video within minutes! Magic Style: Automatically apply Magic Style templates to your movies, complete with effects, titles and credits. Magic Music: Automatically create movie soundtracks and sync melodies to fit the length of your video. Magic Cut: Edit clips by removing action-less scenes and keeping the best footage. Magic Motion: Animate photos to create dynamic photo slideshows. PowerDirector provides multiple modes of editing at startup. With the Full Feature Editor, you can completely control your video editing. Need a quick yet impressive edit? Choose the Easy Editor and SlideShow Creator to create magic movies or impressive photo slideshows in minutes. Take advantage of PowerDirector's flexible and easy-to-use interface to create like a pro! Undock preview window, expand and collapse timeline tracks, drag-and-drop functionality, customizable hotkeys and video editing controls that are organized intuitively and more. All these adds up to make PowerDirector an efficient and pleasant video editing workspace. TrueVelocity® technology is unparallel when it comes to speed. In PowerDiretcor 11, the new TrueVelocity® 3 engine now supports multi-GPGPU acceleration and OpenCL, you can maximize performance from multi-graphic cards installed on computers, as well as ultizing both CPU and GPU's processing power. Providing the optimized editing, rendering and video effects processing speeds. From burning videos to DVDs, creating video files to watch on mobile devices and sharing to social sites, including Facebook, YouTube, DailyMotion, Vimeo and NicoNicoDouga, you can output videos in many ways to share with friends and family..
For fast-paced video production, PowerDirector 11's greatly revamped user interface includes dockable preview windows with dual screen support, customizable hotkeys, scalable library thumbnail, increasing timeline height for better view of timeline objects, all resulting in the most productive work environment. The list above represents camcorders from major camcorder brands that were tested by CyberLink, however, the list is not comprehensive. If your camcorder or format is not on the list it may still be compatible with PowerDirector. The list above represents cameras from major brands that were tested by CyberLink, however, the list is not comprehensive. 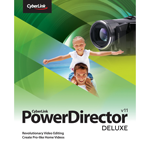 If your camera is not on the list it may still be compatible with PowerDirector. The list below consists of devices from major brands that were tested by CyberLink, however, the list is not comprehensive. If your device is not on the list it may still be compatible with PowerDirector.